Royle said she researched past advertising campaigns and included not only two different versions of the iconic “Moxie Boy” and Red Sox slugger Ted Williams, but also rarely seen characters from a 1926 ad and a 1950’s Diet Moxie ad. Royle, 26, has been creating different types of artwork since high school and works in pencil, pen and ink, oils, and digital art mediums. She works full-time at C&G Pizza in Sanbornville and works on her art in her spare time. In September, 2016, she showed her work at the Gaffney Library in Sanbornville. Her work can also be found on Society6 and Instagram under hsirapelyor. She has never been to the Moxie Festival before but does occasionally drink the distinctively different beverage. In addition to a $100 cash prize, Royle will receive the first 2018 printed T-shirt and will serve as parade float judge. 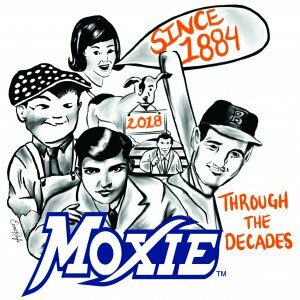 The Moxie Festival, celebrating Maine’s official soft drink, is always the second weekend in July. Mark your calendars for the 2018 Moxie Festival, July 13 – 15, 2018.